Are you moving into a larger home that is better suited to your growing family? Perhaps your children have started college and you want to downsize into a cozier condominium, or you’re changing jobs and need to move out of state. Whatever your needs might be, a moving company from Berwyn, PA, like Suburban Solutions, can help. For a complimentary quote, please contact our team today. As one of the foremost moving companies in Berwyn, Pennsylvania, it is our goal to provide you with professional services that lead to a smooth transition out of your old home and into your new one. We understand the stressors associated with moving, and will do our best to alleviate them so you can easily focus on other tasks. Our moving company in Berwyn, PA has gone from a few trucks to a mid size moving company with a fleet of trucks and more than 70 team members. We’ve successfully completed many relocations in Berwyn, PA, out of state, and across the country. 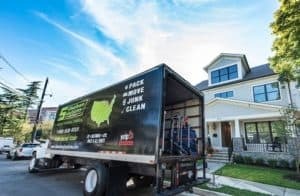 We have earned a reputation of being a leading moving company on the east coast and work hard to keep it. If you would like to find out what other people are saying about our services, contact the moving company Berwyn, PA residents trust. Local Moves- If you’re moving down the road, or across town, let us pack your belongings, load them, and unpack them for you. Office Move – If you’re moving into a new office, our Berwyn, PA moving company can break down and pack equipment, office furniture, and wiring. We’ll bring it to the new space and unpack as much as you ask us to. Out of State Move – If you’re moving to the next state over or far across the country, we know this is a major transition and will help you to get it done in a timely manner. Packing and Unpacking – Naturally you may want your belongings to be as secure as possible so that they don’t get damaged. We’ll carefully pack up and label your items in a strategic way while implementing care and respect for each and every belonging. Once we’ve arrived, our team will unpack the items and help you to place them in the right area of your new home. Heavy Furniture Lifting and Moving – Heavy furniture must be moved in a particular way; otherwise, there is a high risk of injury. Our moving team has the strength and skill needed to move large cabinets, wooden dressers, couches, artwork, and other heavy furniture items with ease. Removal of Your Unwanted Items – While moving you might find that you have a lot of items you no longer want. Our moving company can take these items, sort through them and take them to junk facilities, recycling centers, or donation organizations in Berwyn, PA. Cleaning Services – Let us clean your old home from top to bottom so it’s ready for turnover and passes the final inspection. This is especially beneficial if you need to get your deposit back. We also offer regular cleaning services at homes and offices. If you would like to learn more about our comprehensive moving services, call our insured moving company in Berwyn, PA, Suburban Solutions, today.